You can only control 1 "Spectral Ice Floe". This card on the field is unaffected by its controller's card effects. Once per turn, you can banish 1 DARK Monster in your GY; this turn while this card is face-up on the field, your opponent cannot negate the activation of cards you control except this one. If this card is sent from the field to the GY, you can pay 1000 LP; Special Summon 1 banished DARK Monster. Pendulum Lore: If a monster is Special Summoned from the Extra Deck to your field: You can Special Summon this card from your Pendulum Zone in Attack Position, also, all "D/D" monsters you control cannot be targeted by card effects until the end of the next turn (even if this card leaves the field). 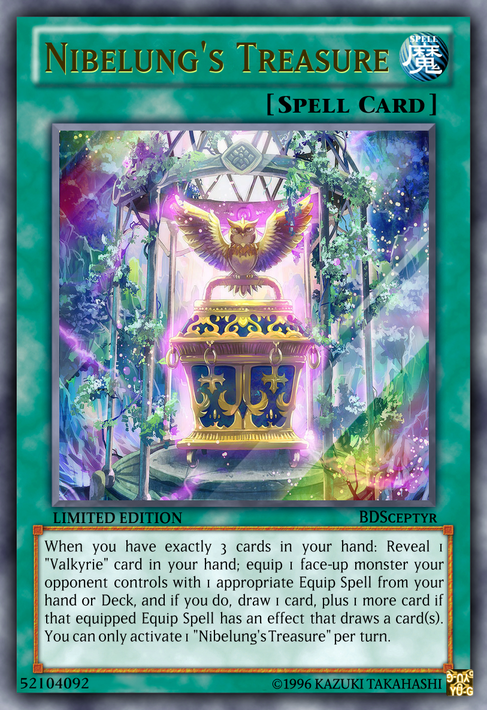 Lore: If you control a "D/D/D" monster that was Special Summoned from the Extra Deck: You can Special Summon this card that is either in your hand or banished. If this card was Pendulum Summoned from the Extra Deck this turn: You can target 1 Pendulum Monster in your Pendulum Zone; Tribute this card and 1 "D/D" monster, and if you do, Special Summon that target. You can only Special Summon "D/D Brownie(s)" once per turn. Gives your D/D stuff protection, so great on the first and second turns, even if it gets Ghosted. Brings itself from hand or banished zone when you bring out a big boss. Of course, it's Summoning needs to be limited with all the variety it brings to your plays as a Pendulum Monster. You can send the equipped monster to the Graveyard: Destroy all cards your opponent controls, then inflict 500 damage to your opponent for each monster destroyed. Your opponent takes no damage for the rest of the turn after this effect is activated. Pretty simple, actually. No longer destroys the equipped monster, to at least limit some abuse, and prevents more damage after use. It's a generic field nuke that also burns, but it has some competence. Allow me to explain how Vision HERO monsters worked in the manga: That Trap effect is mandatory, so the tiniest bit of damage would make half your Graveyard jump into the backrow. The effects after selecting a target occur simultaneously, meaning that you need to have an empty Monster Zone to use it, but the Tribute and optional monster pop happen simultaneously, meaning that if the Summon is negated, you don't lose your monster. Lore: (Quick Effect): You can destroy 1 Continuous Trap you control: Special Summon this card from your hand. While this card is in your GY, if you take damage: Place this card in your Spell/Trap Zone as a Continuous Trap Card, but shuffle it into the Deck when it leaves the field. While this card is treated as a Trap Card, you can target 1 monster you control: Special Summon this card, then Tribute that target, and if you do, you can destroy 1 monster your opponent controls. You can only control 1 "Vision HERO Minimum Ray". This card has a limit in field presence now; one I plan to exert on any future Vision HERO cards we remake here. However, it does now also come from the hand as a Quick Effect by wrecking another Cont. Trap. Sure True Kings will appreciate it. Streamlined the Trap-to-Tribute process a bit more, but it's good and proper now with Minimum Ray's limit. If this card is Normal or Special Summoned: You can place 1 "Vision HERO" monster from your Deck or Graveyard into your Spell/Trap Zone as a Continuous Trap, except "Vision HERO Increase". While this card is in your Graveyard, if you take damage: Place this card in your Spell/Trap Zone as a Continuous Trap Card. While this card is treated as a Trap Card, you can target 1 monster you control: Special Summon this card, then Tribute that target, and if you do, you can Special Summon 1 "Vision HERO" monster from your Deck, except "Vision HERO Increase". You can only activate this effect of "Vision HERO Increase" once per turn. I disagree on the way to control the absurd parts of the Vision HERO clauses. Instead of limiting the field presence, or preventing repeat recurrence, I believe that the real limitation needs to be a HOPT on the exit effects. This also doubles as a Sapphire Pegasus for the archetype, to better utilize the gimmick. If this card is Normal or Special Summoned, you can add 1 "Vision HERO" monster from your Deck to your hand, and if you do, take damage equal to its ATK/DEF (whichever is lower). While this card is in your Graveyard, if you take damage: Place this card in your Spell/Trap Zone as a Continuous Trap Card. While this card is treated as a Trap Card, you can target 1 monster you control: Special Summon this card, then Tribute that target and if you do, you can halve the ATK/DEF of 1 monster your opponent controls. You can only use this effect of "Vision HERO Poisoner" once per turn. You do need something to trigger your self-damage right? You can send 1 "HERO" card from your hand to the Graveyard: Special Summon this card from your hand. If this card is Normal or Special Summoned: You can send 1 "Vision HERO" monster from your Deck to the Graveyard. While this card is in your Graveyard, if you take damage: Place this card in your Spell/Trap Zone as a Continuous Trap Card. While this card is treated as a Trap Card, you can target 1 monster you control: Special Summon this card, then Tribute that target, and if you do, you can make both players take 500 damage. You can only activate this effect of "Vision HERO Faris" once per turn. Opened up the discard to literally any HERO, made the dump optional, and gave it the archetype clause with a tiny bit of burn to put everybody in the backrow where they need to be. You can discard this card; you take 1000 damage, also you can add 1 Level 4 "Vision HERO" monster from your Deck to your hand, except "Vision HERO Gravito". You can only use this effect of "Vision HERO Gravito" once per turn. (Quick Effect): You can Tribute this card; Special Summon up to 2 "Vision" HERO" monsters from your Spell & Trap Zone, but banish them when they leave the field. You can only Summon "Vision HERO Gravito(s)" once per turn. Allows you a chance to trigger some Vision HERO stuff on a discard, and search the other Vision HEROs of its Level. also it can use that first effect as a Quick Effect, in case you want to get more value out of them. Okay, cuz Summon lock. I mean, you wouldn't need the military grade restrictions if Gravito retained the Tribute as a condition for a frontrow load instead of as a Quick Effect cost. Just a thought. If a "Vision HERO" monster(s) is destroyed: You can place 1 of those monsters directly into your Spell/Trap Zone as a Continuous Trap Card and/or Special Summon 1 Level 4 or lower "Vision HERO" monster from your hand or Deck. If your LP are lower than your opponent's by 1500 or more, you can activate this card from your hand. You can banish this card from your Graveyard (Quick Effect): Halve the ATK of the monster your opponent controls with the highest ATK, and Special Summon 1 "Vision HERO" monster from your Graveyard with ATK less than or equal to that lost ATK, and if you do; gain LP equal to double the ATK of the Summoned monster. You can only activate this effect of this card's name once per turn. Gives the option to Set the destroyed thing into your backrow so you're not forced to tank damage, a handtrap condition if you're playing the Deck right, and carries a strong Graveyard effect that refunds some of the damage you are taking. Last Vision HERO card I'll ask for, promise. If this card is Normal or Special Summoned: you can draw 2 cards, then place 1 “Vision HERO” Monster from your Hand to your Spell/Trap Zone as a Continuous Trap Card. Otherwise, shuffle your entire hand into the deck. While this card is in your Graveyard, if you take damage: Place this card in your Spell/Trap Zone as a Continuous Trap Card. While this card is treated as a Trap Card, you can target 1 monster you control: Special Summon this card, then Tribute that target, and if you do, original ATK of one “HERO” Monster you control becomes double its original ATK. You can only activate each effect of “Vision HERO Multiplier” once per turn. Everyone loves power, but it comes at the cost of playing Vision HEROs if they ever became a thing, making it a more high risk version of Allure. In addition it can permanently make Vision HERO Trinity into a 5K beater. When a monster you control is targeted for an attack by an opponent's monster, or by the effect of an opponent's monster that would destroy it: Activate this card by making both battling monsters unable to be destroyed by that battle or effect, and if you do, until the 2nd Standby Phase of their controller's turn, place them in their owner's Spell & Trap Zone as Continuous Spell Cards, but they cannot be targeted by card effects. Destroy this card during your opponent's 2nd Standby Phase after this card's activation. When this card leaves the field, return all monsters placed in the Spell & Trap Zone by this effect to the field in Attack Position. Made the effect a bit more spruced up, turning the attacking monsters into Continuous Spells. Course they already can't attack and their effects don't apply as Cont. Spells. Does return the monsters to the field in Attack Position if this card gets destroyed, though. Also, it triggers on monster effect targeting too, so unless it's a Borrel, this can help get past spot removal with your own form. ●When this card is Fusion Summoned: You can draw 1 card, and if the drawn card is a "Vision HERO" monster or "Vision Fusion"; you can destroy a number of cards your opponent controls up to the number of Fusion Materials used for this card's Fusion Summon -1. You can only activate 1 "Vision Fusion" per turn. Because I like unusual Fusion Spells, and this gives the Deck a bit more effect removal that also incentivizes Fusion bosses. "Skull Mariner" + "Skull Knight" or "Skull Knight #2"
Why no I'm not bitter over how haphazard the support for Archfiends has been, why do you ask? Really, though, the alternate Summoning conditions are in regard to Skull Knight #2's interaction with Archfiends in the set it debuted in, Legacy of Darkness. There was a method to the madness. Speaking of which, both Skull Knights can be used as Fusion Materials now. Alternate conditions can be fulfilled as easy as putting away two Skull Archfiend monsters. Has a window out for Fiend monsters, so blaze out those Archfiends at will. And, thanks to the interaction, those Archfiends won't blow up Lock. Must first be Ritual Summoned using "Ritual of the Matador". Cannot be destroyed by battle or card effects. Your opponent cannot attack "Archfiend" monsters, except this one. You take no damage from battles involving this card. A monster that battles this card, and your opponent's other cards in the same column as that monster, are destroyed after the Damage Step. ●All cards destroyed by battle with or the effect of this card are banished instead, also, if a card(s) is banished this way, you can add 1 "Archfiend" card from your Deck to your hand. At the end of the Battle Phase, if this card battled, you can Special Summon 1 "Archfiend" monster from your hand or Graveyard. Removed its idiotic restriction, gave it a magnet effect, extended its protection to effect destruction, and now it cleans a column each battle. Made the Ritual Spell and gave it a Graveyard effect which lets you use it as Foolish Burial Goods fodder even if you don't want to play Matador. Lore: Place 1 "Elemental HERO" monster you control or 1 "Elemental HERO" monster in your hand on the bottom of your Deck; Special Summon 1 "Neo-Spacian" monster from your Deck, but it cannot activate its effects this turn. If you returned a Fusion or Normal "Elemental HERO" monster this way, you can Special Summon 1 Level 7 or lower "HERO" Fusion Monster from your Extra Deck that specifically lists the returned monster as 1 of its Fusion Materials instead, ignoring its Summoning conditions. ....and considering Mask Change 3: The Maskqueradening E N Shuffle de la BD'S now allows you to return stuff in the hand too, it kinda needs to not let the Fusion recur. But fret not, for if it brings out a Neo-Spacian, it will only prevent its activation effects from going off for one turn: so that Grand Mole will be ready to go on your opponent's turn! ●Cannot be used as Material for a Summon. Once while this card is face-up on the field, and your opponent's monster attacks: You can negate that attack, and this card's effects. You can banish this card from your Graveyard, except during the turn it was sent there: Add 1 "Twin Pillars of Ice" from your Deck to your hand. Gimmicky? Yes. Bad? A little. But a very interesting option in a casual match, making for a way to absorb two attacks and then make some sort of Link or Synchro play with the Token(s) that survives. Once per turn, if a monster you control would be sent to the GY: You can move that monster to an unused Main Monster Zone on your side of the field instead, and if you do, place 1 Beacon Counter on this card (max. 5). Each time a Beacon Counter is placed on this card, target 1 Main Monster Zone on your field: Send any monster in that Zone to the GY if possible, then that Zone cannot be used while this card is face-up on the field. You can send this card with 5 Beacon Counters on it and all cards in your hand to the GY; add 4 cards from your GY to your hand. You cannot conduct your Battle Phase the turn you activate this effect. Let's see how many people I can make hate me with this next one: Nibelung's Treasure. Lore: When you have exactly 3 cards in your hand: Reveal 1 "Valkyrie" card in your hand; equip 1 face-up monster your opponent controls with 1 appropriate Equip Spell from your hand or Deck, and if you do, draw 1 card, plus 1 more card if that equipped Equip Spell has an effect that draws a card(s). You can only activate 1 "Nibelung's Treasure" per turn. Can only be equipped to a LIGHT Machine-Type monster. The equipped monster gains 300 ATK, and cannot be targeted by other card effects. If this card is equipped to "Cyber Dragon", or a Fusion monster that uses "Cyber Dragon" as Material: Draw 1 card (you can only activate this effect of this card's name once per turn). If the equipped monster destroys your opponent's monster (by battle or its own effect): You can banish that card and 1 other card on your opponent's field or in their Graveyard. Helps a lot more with your desired goal of an OTK with CyDras, gives more technical application to Cyber Twin on top of making CDI have increased value as a removal tool. The effect of Retribution of the Retribution of the Ant Lion is actually "When a monster is destroyed and sent to the Graveyard, inflict 800 damage to its controller."